Update (June 21st 2009): The Lebanese broke the record!!! The new Guinness Book Record is 4475! Congrats. Take part in making history! Come help Tollab - the Lebanese students’ federation in Montreal - in one of the biggest record breaking events of 2009! It is within the framework of the annual Lebanese festival in Montreal (held on June 19th, 20th and 21st 2009) that Tollab, in collaboration with MAESTRO travel, aims at setting up a new record for the longest dabke chain ever assembled; an accomplishment that will enter the famous Guinness book of records after being approved by its official representative. The Federation’s goal is to gather 3500 people at the Marcelin-Wilson Park on the 20th of June, and invite them to dance the Dabke for at least 5 minutes. This event will provide Montreal an international exposure that will highlight its multicultural face, hence uniting all Lebanese and Montrealers of all colors, religions, names or cultures. 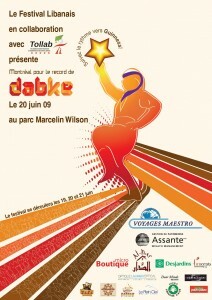 The event will take place at 7:30 pm on June 20th 2009 at the Marcelin-Wilson Park, which is located on 11301 boul. de l`Acadie in Montreal, Quebec. If you would like to participate, there’s no registration beforehand, so you only need to show up for the event. For more information, you can visit the event’s official facebook page here, or contact Tollab at communication@tollab.ca. Posted: June 9th, 2009 under Cultural, News. Thank you for the post!! We all here count on you! great idea ! maybe the chain can reach Ottawa ! What a fun and creative concept!!! It was a great success !!!!! Congrats! A special thanks to Rabih Dagher for all the updates and invitations!!!!! it makes me verry happy to hear this wonderfull news , well done guys and well done to lebanon.